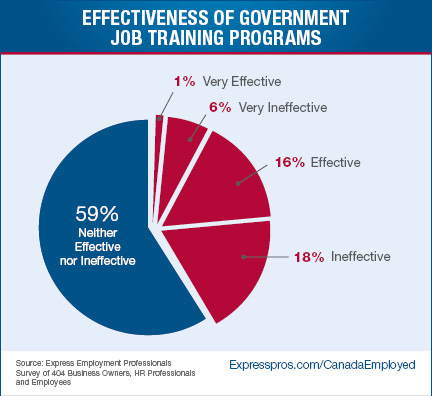 TORONTO, ONTARIO--(Marketwired - June 17, 2015) - Express Employment Professionals released survey results today on the effectiveness of job training programs. Results show very little confidence in such programs among employers. In a survey of businesses, respondents were asked, "How effective are government job training programs?" Of those surveyed, 16 per cent said they are "effective," while one per cent said they are "very effective." Meanwhile, 18 per cent called them "ineffective" and six per cent see them as "very ineffective." A majority, 59 percent, said they are "neither effective nor ineffective." "There's been much discussion about the skills gap in North America; employers can't find workers with the right skills. Ideally, government job training programs would be helping to fix this problem, but this survey shows that employers don't have much faith in them. The simple fact is, 83 per cent of businesses don't see these programs as effective," said Bob Funk, CEO of Express, and a former chairman of the Federal Reserve Bank of Kansas City. "A successful job training program would equip workers with the most in-demand skills, allowing them to take advantage of current jobs openings in new fields." The survey of 404 businesses was conducted in December 2014 and January 2015. Results have been released periodically throughout the year as part of Express Employment Professionals "Canada Employed" series. Express Employment Professionals puts people to work. It generated $2.85 billion in sales and employed more than 456,000 people in 2014. Express ranks as the largest franchised staffing company in the United States and the second largest privately held staffing company in North America. Its long-term goal is to put a million people to work annually. Express launched in Canada in July 1996, with a franchise in London, Ontario, and since then, has expanded and grown across Canada significantly. There are currently 36 Express franchises in Canada - five in British Columbia, five in Alberta, two in Saskatchewan, 23 in Ontario and one in Nova Scotia.